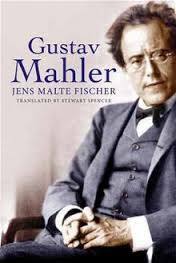 Gustav Mahler by Jens Malte Fischer, translated by Stewart Spencer. The composer of famously large-scale symphonies has elicited some exceptionally large books, among them the three eccentrically structured volumes by Donald Mitchell and the four insanely comprehensive volumes by Henry Louis de la Grange. Fischer’s book is modest by comparison, being a single volume, but still, it tips the scales at 766 pages. The book is more of a cultural history than a life and works. “It is impossible to say for certain when Mahler was first introduced to the ideas of Gustav Theodor Fechner…” is not an atypical sentence. The book reminds me a little of Jacques Barzun’s book on Berlioz: a lot of cultural history, but thin on the music. In fact, I’m not too sure how much Fischer likes Mahler’s music, with the short chapters on the pieces overly indebted to Adorno’s compulsive skepticism about anything affirmative in the music. The slaughtered animals mentioned in the text of the Fourth Symphony’s last movement supposedly make the finale of the Fourth “undermine[s] the brief [?] assurance of the Adagio”; “Mahlerians will find it hard to set aside their sense of uncertainty” about the Third; “astonishingly crass contradictions and inconsistencies typify the first three movements of the Fifth”; and so on. While I learned things here that I have not read elsewhere, the best writing about music draws me back to the pieces, and on that count the book fails. 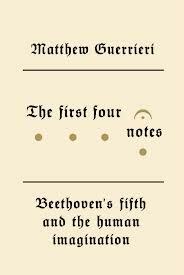 The First Four Notes by Matthew Guerrieri. The central focus here is the Beethoven Fifth, particularly the opening motif . * But the myriad spokes radiating outward from that hub represent an alarmingly vast array of topics – from Hegel to Saturday Night Fever, from the French resistance to Beecham’s Pills. There is a good bit of heavy lifting here in the sections on philosophers, but Guerrieri does his best to tie helium balloons of clarity to the German ballast, and I understand slightly more about Kant and Hegel than when I picked up the book. Slightly. Guerrieri’s wit and easy erudition about almost anything, familiar from his blog Soho the Dog, make for a book that is a little like the results of a Google search with “Beethoven’s fifth, the first four notes” as the search terms – except that with this search, every one of the multitude of links is worth reading, and the results have been elegantly formed into appealing larger shapes. Go here for the book’s related website. Linking the two paragraphs above together, check out Guerrieri’s great comics involving Mahler and Strauss – and the movies.